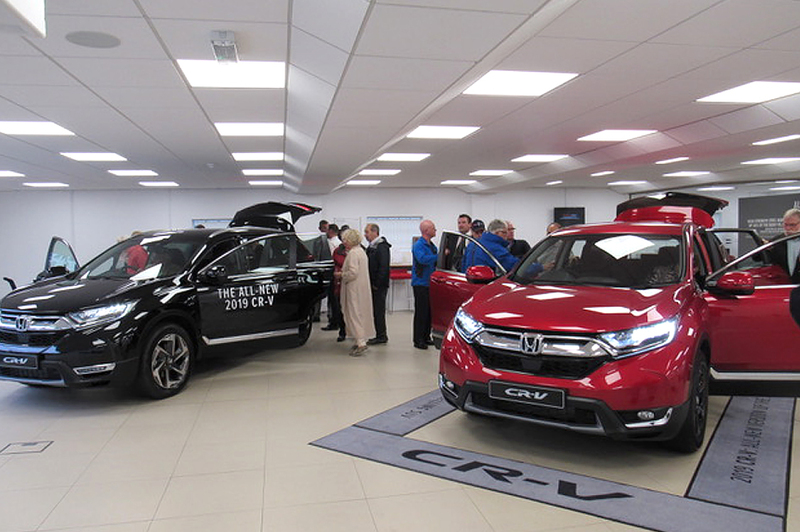 In February 2018, our showroom located on Kingswood Grove, Douglas, Isle of Man, underwent a major refurbishment and last night was the perfect opportunity to combine a VIP evening along with the first ‘on-island launch’ of Honda’s latest release. As the Island’s sole Honda Car Franchise Dealership, guests who attended last night’s event are amongst some of the first in the world to see Honda’s fifth generation CR-V and today we welcome you and your family to visit our showroom and check out Honda’s latest installment for yourself. Honda have made vast improvements on the previous CR-V model, here’s a snippet of what’s new. A larger wheel base (+33mm). Shorter length (-5mm) which enables you to see the end of the bonnet. All lights, except the fog lights, are now L.E.D. Reducing the battery power needed. Built with light-weight, high-strength steel to improve safety without negotiating on performance. Integrated with APPLE CarPlay® AND ANDROID AUTOTM. You can seamlessly integrate your Android phone or iPhone to the Honda CONNECT infotainment system with 7″ touchscreen allowing you to make calls, listen to music or send and receive messages. We believe everyone who travels in the new CR-V should be made to feel warm and comfortable. Enjoy the feeling of a warmth on those cold Manx days with a heated steering wheel as well as heated seats. It’s little details like this that make driving the CR-V a pleasure. Engage reverse and the rear-view camera automatically comes to life on the 7″ Honda CONNECT screen, making reverse parking a doddle! The automatic tailgate is operated by passing your foot under the rear bumper. Perfect for when you have your hands full. With blind spot information, making lane changes and overtaking is much safer, warning you when vehicles are detected in your blind spot by illuminating a light in your door mirror. When reversing, the Cross-Traffic Monitor can detect approaching vehicles from either side and warns you of imminent danger and just when you thought things couldn’t get better, this car is also fitted with an emergency call (SOS) switch is located within easy reach, adjacent to the rear-view mirror. The CR-V also includes Honda’s unique sensing system including features such as, Collision Mitigation; If there is the possibility of a collision with a vehicle or a pedestrian this feature will alert you to the danger, as well as reducing your speed to help minimise the severity of any impact. For full details of technical specifications and to arrange a test drive, please visit our showroom or contact us for more information.